Trousers or shorts - Official olive trousers or shorts are available in cotton, polyester/cotton blend, and polyester/wool blend. Socks - Olive socks are available in three lengths: ankle, crew, and knee. 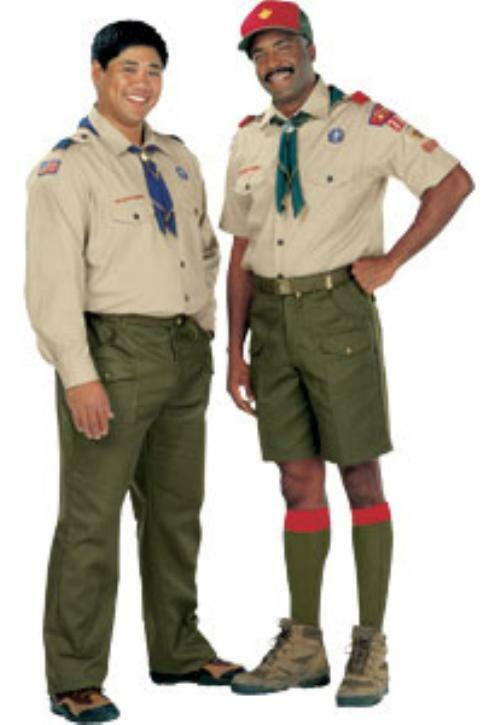 Belt - Leaders may opt to wear the olive web belt or an official leather belt. Cap - Leaders who opt to wear a cap may wear the blue and gold leaders' cap or they wear the same cap as the youth they serve. Necktie - An olive or tan dress tie may be worn. Necktie - A Cub Scout leader bolo tie is also available. 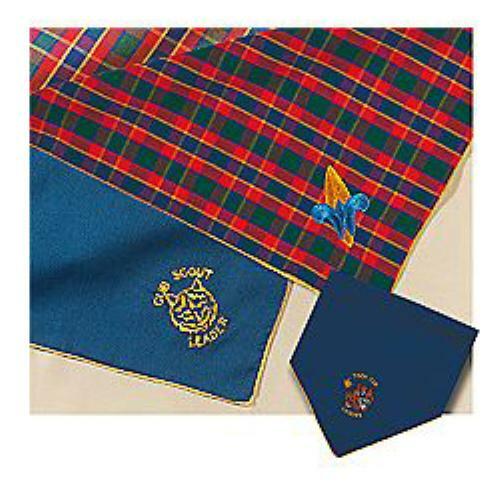 Leader Neckerchiefs - A Cub Scout leader neckerchief with navy blue with gold edging and gold Cub Scout emblem may be worn by all Cub Scout leaders. 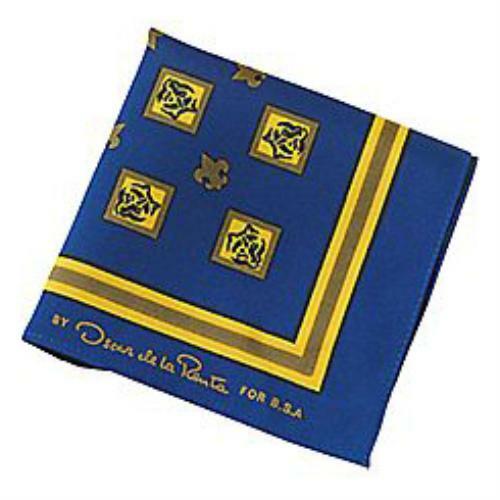 Specialized neckerchiefs are also available for Tiger Cub den leaders and Webelos den leaders. 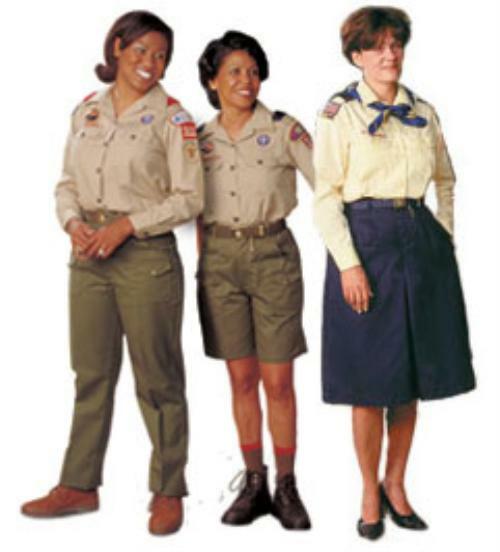 Women who serve as adult leaders in the Cub Scout program have two uniform options. Tan/Olive Uniform - Female leaders may wear the tan and olive uniform, identical to the one worn by men. Uniform options for women also include culottes or a skirt, and a scarf is available as a neckwear option. Female leaders who wear culottes or a skirt may opt to wear hose instead of the uniform socks. Trousers, shorts, skirt, or culottes—Official blue. Blouse—Yellow shirt is available with long or short sleeves, button-down pockets, and epaulets. Socks—Official blue socks are available in three lengths: ankle, crew, and knee. Female leaders who wear culottes or skirt may opt to wear hose instead. Belt—Official blue web belt with the Cub Scout logo. Cap—Leaders who opt to wear a cap may wear the blue and gold leaders' cap or they wear the same cap as the youth they serve. Scarf - An official scarf.